Hey gang! I truly appreciate all the encouragement everyone has been giving me over these past few months. It really makes a difference knowing that I have so much support going into the Xterra World Championships in a few weeks. When you have a chance, take a look at my newsletter. We just released the Paterson Press online version today. Enjoy the cooling weather. Man what a difference it makes riding up Nate Harrision! When you have a chance, take a look at my newsletter. We just released the Paterson Press Fall 2013 online version today. There is an often-quoted mantra within triathlon that it’s a mental sport as much as physical one. While there is a lot of truth in that – although if you haven’t done your physical training no amount of mind-bending skills are going to get you over most finish lines – the mental-physical interdependence is not reserved just for the race itself. Mental fortitude is just as important in training as in a race, especially at the end of a tough block of consecutive days of physical torture or, for example, a three-week schedule of increasingly demanding daily sessions. It’s no secret that, at the end of a tough block of training, it gets harder and harder to stay motivated. The key to completing a training session, or multi-week training block, when you are physically drained and finding it tough to continue, is to focus on your immediate training demands and let the end game take care of itself. Every step counts so it is important to “stay present” and not to just zone out. You have to live in the moment, even when you’re tired. Think of each training session as a stepping-stone. However, to reach your triathlon or fitness goals you have to complete all the stepping-stones on the way, in the correct order. So focus on completing them one at a time, step-by-step. If you do complete them, you’ll reach your eventual goals. If you don’t complete each step, each training session, the chances of reaching your triathlon goals diminish. So when things get physically tough and motivation becomes increasingly hard to find, focus on the immediate session, and take care of your next few minutes of training, and don’t think that you still have days of difficult punishment still to go. Focus on the short-term, and have faith in the power and benefits of a well-put-together training schedule. 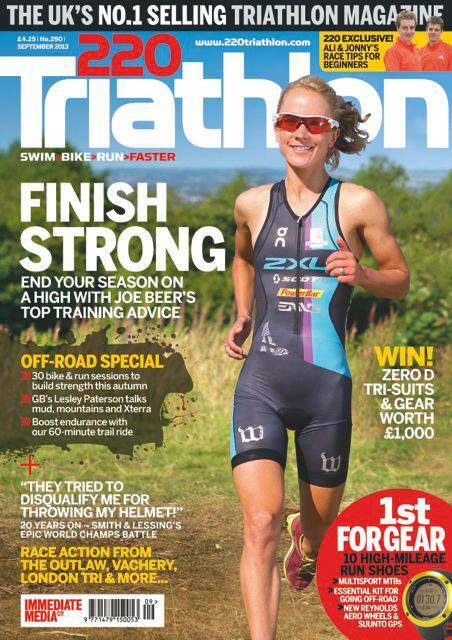 Lesley Paterson Graces the Cover of 220 Triathlon! 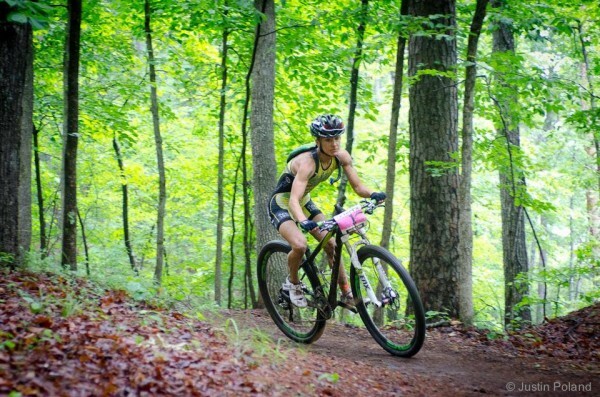 Xterra East Championships – Richmond, Virginia – Where’d the Swim Go! Less is not always better than more! Extra water in a fast flowing James River as a result of torrential rains from two recent storms meant it was too dangerous for the swim segment of the Xterra East Championships. So the race turned into a duathlon – short run, regular bike, regular run. I’m no stranger to duathlons, being a second place finisher in the world championships at the age of 19. But having no swim at an Xterra champs was a little discombobulating! 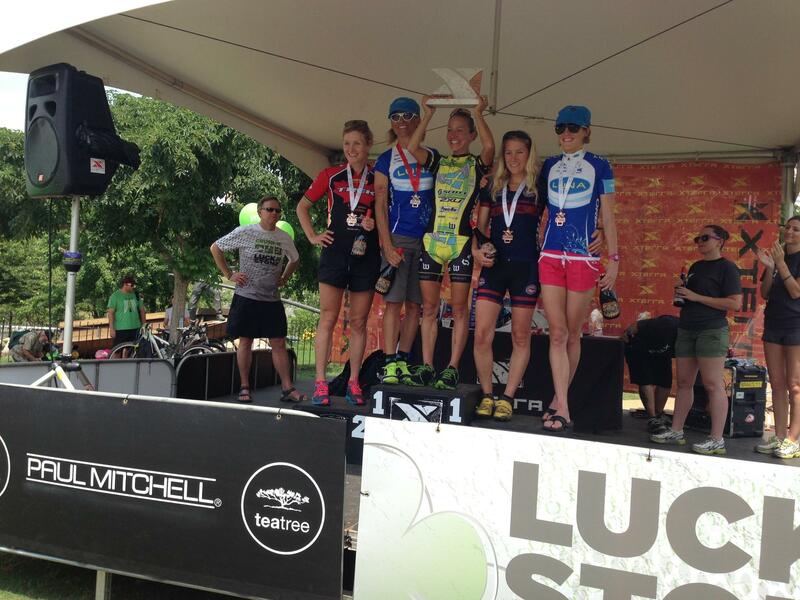 Not that it mattered in the end as it was another victory, making it three for three in Xterra Championships in 2013. I led for most of the first of two laps on the technical bike course before Shonny Vanlandingham zipped on by and I just tried to keep her close for lap two. I am really happy how I have managed to elevate my mountain bike skills in the past 18 months. Lots of trail riding in training in almost perfect year-round San Diego weather is the key. I cruised passed Shonny a mile or so into the run, posting an average run speed around 6.3 minutes per mile for most of the race, and winning by a couple of minutes. I felt really good and it was a great confidence builder on a course I have never conquered before mainly because of the technical bike section. While that may be three in a row in 2013, I would now like to race in a warm, dry and dusty environment please, after back-to-back championships – Alabama and Richmond – that had rainy and slippery conditions! The weather gods please take note! Xterra Southeast Championships – Another Victory in Crazy Conditions! That was interesting! I grew up trail running the hills of Scotland in the rain and wind, but back then I wasn’t into mountain biking. So riding in the rain and slippery conditions of Xterra Southeast Championships in Pelham was something I was not used to. I settled into a good place on the mountain bike despite the weather, jockeying for the lead. I was happy to focus on safety rather than speed and just wanted to make it through to my go-to discipline – the run – in one piece! Even so, I fell off the bike four times! The roots were like ice! If you didn’t go over them at the right angle you came off. By the end, I was getting pretty proficient at crashing, although I’ve since been told that wasn’t the point of the bike leg! Never felt happier to get out onto the run in a race! And without injury from the ride! Took the lead soon into the run and cruised to a good time all things considered. Ironically, a couple of days later I was out on a training ride and climbing Palomar Mountain’s 5,000 feet Nate Harrison trail in San Diego County in 100-degree heat thinking a bit of Alabama rain would go down nicely right about now! Whiskey 50 – A Long & Successful Ride! This was long! Fifty miles long! Fortunately, it was also fruitful. Chalk up another good win. The longer the race, the more draining it is mentally. Especially a mountain bike race where you have to concentrate the whole time or you’ll end up over the handlebars. Mountain biking is a proverbial double-edged sword. It’s a fantastic sport and in a race like the Whiskey 50 there is something new around every corner and over every climb, so no seemingly endless, familiar miles on roads like in an a 70.3. But on the flip side there is no zoning out like on the road, where you can just get settle down and become immersed in your steady breathing and your cycling rhythms. Sure, you can settle into a rhythm mountain biking, but you can never zone out! The margin for error is way less off-road. In mountain biking you have to stay focused or you’ll come off the bike, so it is more mentally taxing. But it can also be way more fun! Woohoo! The first edition of The Paterson Press is finally complete! Take a look and let us know if you’d like to be added to my mailing list. Just send my business manager Leigh-Ann a quick note with your contact info and she’ll get that taken care of. She’s at Leighann@lesleypaterson.com. Thanks for all your support! 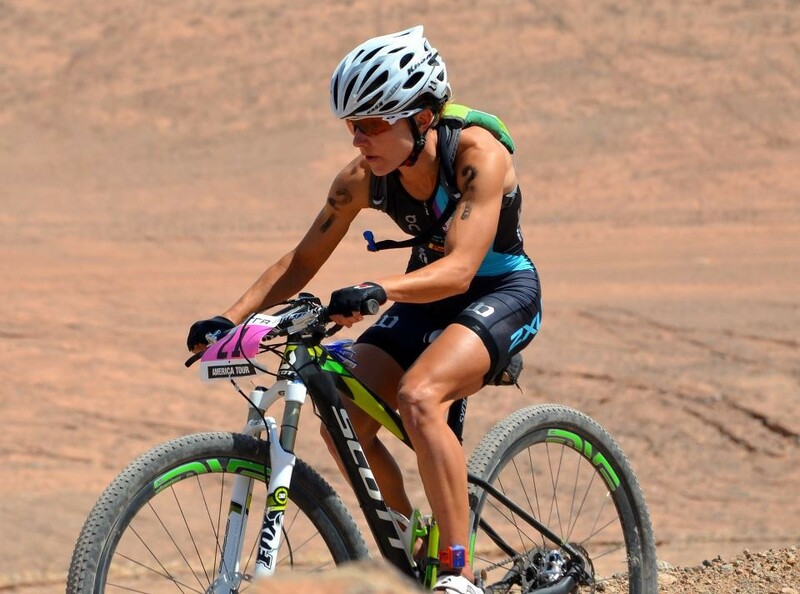 I had a fantastic race at the Xterra West Championships in Las Vegas. It was a lot of fun! I finished fourth OVERALL, which was really cool, and 13 minutes ahead of the second placed female. I felt amazing and truly unstoppable. Training had gone so well and I was excited to race everyone. After a solid swim, I felt really strong and powerful on the bike. I was excited to be around the pro men on the trails and keeping up. Then an even better feeling was when I started passing them! I’m comfortable with loose rocky descents, living in San Diego and training on the trails there, so that part of the course was easy! Historically my run has always been my true strength, although now I tend to be the fastest on the bike as well. On the run, I just felt strong and powerful and was surprised that I was catching and passing even more of the pro-men. I enjoyed just working hard and being in control! I came into the California Ironman 70.3 at Oceanside as relaxed as possible, not thinking about how I would do and determined to just race and have fun in what is essentially my local San Diego 70.3 race. Already coming off race success off-road to start this season in both Xterra and mountain biking I was just keen to see how that would transfer to the road. As it turns out, it transferred brilliantly. 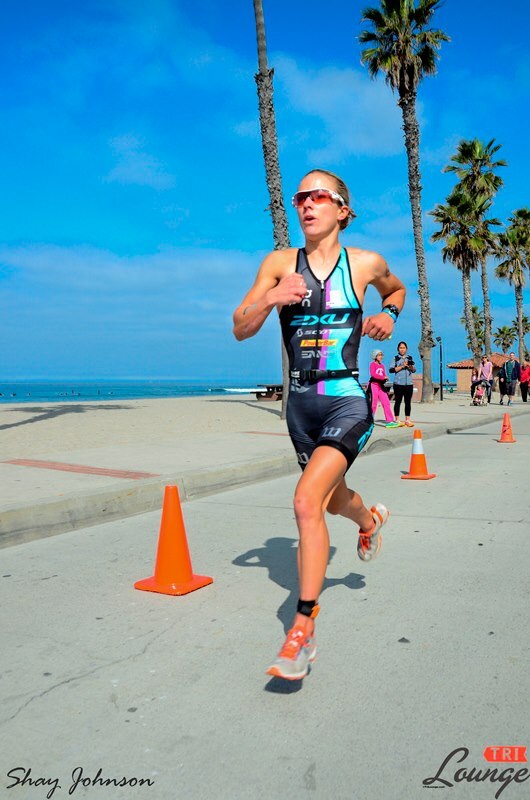 After being happy with my swim and staying within closing distance of a breakaway front five on the bike, I then posted the best run time ever for a female at Oceanside with 1 hour 16 minutes 21 seconds, picking off top pros to gain a podium slot with third place. My run time was about a minute better than the next best time on the course and everything felt fluid and moved easily. I was jazzed at such a great run performance and that the day was such a fun one as it always is at Oceanside.